+In the Name of the Father and of the Son and of the Holy Spirit. Amen. Make us worthy, O Lord, to be kept without sin this evening. Blessed are You, O Lord, the God of our fathers, and praised and glorified is Your Name unto the ages. Amen. Lord, let Your mercy be upon us, even as we have placed our hope in You. Blessed are You, O Lord, teach me Your commandments; Blessed are You, O Master, make me prudent by Your commandments; Blessed are You, O Holy One, enlighten me with Your commandments; Lord, Your mercy endures forever, do not overlook the creation of Your hands. To You belong praise, hymns and glory, to the Father and the Son and the Holy Spirit, now and ever and unto ages of ages. Amen. On September 23rd our Holy Orthodox Christian Church commemorates, honors and entreats the holy intercessions of the following Saints, Forefathers, Fathers, Patriarchs, Prophets, Preachers, Evangelists, Martyrs, Confessors, Ascetics, Teachers and every righteous soul made perfect in Our Holy Orthodox Christian faith: The Conception of Saint John the Baptist and Forerunner; Saint Xanthippe and Polyxeni, disciples of the Apostles; Saint Rhais of Alexandria; Saints Andrew, John, Peter, and Antoninus of Syracuse, martyred in Africa; New Martyr Nicholas Pantopolis at Constantinople (1672); New Holy Martyr John of Epirus (1814); New Holy Martyr (Neomartys) Arsenius of Russia; Saint Adamnan, Egoumenos (Abbot) of Iona; "Hawaiian Iveron" and "Slovensk" Icons of the Mother of God. +By the holy intercessions of Your Saints, Holy Martyrs, Holy Prophets, Holy Mothers, Holy Fathers, Holy Disciples, Holy Neomartyrs, O Christ our God, have mercy on us and save us. Amen. 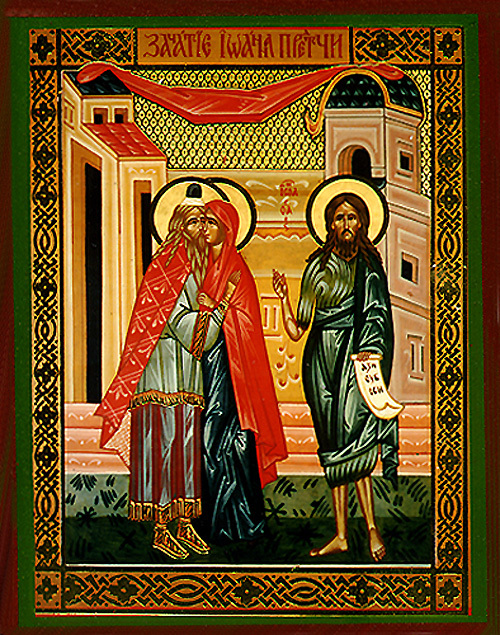 THE CONCEPTION OF SAINT JOHN THE BAPTIST AND FORERUNNER. On this day are celebrated God's mercy, His wondrous act and His wisdom: His mercy towards the devout and righteous parents of Saint John, the aged Zacharias and Elizabeth, who had all their lives begged a child of God; the wonder of the conception of St. John in Elizabeth's more-than-aged womb; and the wisdom of the dispensation of man's salvation. For St. John, God had a specially great plan: that he should be a Prophet and the Forerunner of Christ the Lord, the Savior of the world. Through His Angels, God revealed the birth of Isaac to the childless Sarah, and of Samson to the childless Manoah and his wife, and of St. John the Baptist to the childless Zacharias and Elizabeth. Through His Angels, God revealed the birth of those for whom He had a special plan. How could children be born of aged parents? If someone is curious to find out, let him not ask men, for men do not know, nor does natural law (it being beyond natural law), but let him turn his gaze to the power of Almighty God, Who made the whole world from nothing and Who, for the creation of Adam, the first man, used no parents, either young or old. Instead of being curious, let us thank God that He often reveals to us His Divine power and mercy and wisdom beyond the natural law, by which we would otherwise be fettered and, without these special wonders of God, would fall into despair and forgetfulness of Him. The most basic principle of the Christian moral life is the awareness that every person bears the dignity of being made in the image of God. He has given us an immortal soul and through the gifts of intelligence and reason enables us to understand the order of things established in his creation. God has also given us a free will to see and love what is true, good, and beautiful. However, from earliest years we have the inclination to be attracted to evil and to sin. But we should always remember that our Lord and Savior Jesus Christ's dying and rising offer us new life in the Spirit whose saving grace delivers us form sin and heals sin's damage within us. Therefore we speak of the value, of dignity, and goal of human life, even with its imperfections and struggles. It is distinct from all other forms of life, since it alone is imprinted with the very image of its Creator. The second element of life in Christ is the responsibility of freedom (the free will of man). Without freedom, we cannot speak meaningfully about morality or moral responsibility. Human freedom is more than a capacity to choose between this and that. It is the God-given power to become who He created us to be and so to share eternal union (theosis) with Him. This happens when we consistently choose ways that are in harmony with God's plan. Christian morality and God's law are not arbitrary, but specifically given to us for our happiness. God gave us intelligence and the capacity to act freely. Ultimately, human freedom lies in our free decision to say "yes" to God in contrast, many people today understand human freedom merely as the ability to make a choice, with no objective norm or good as the goal. It is absolutely necessary for all to have good conscience. The possession of a good conscience is another fundamental element of Christian moral teaching. Conscience represents both the more general ability we have as human beings to know what is good and right and the concrete judgments we make in particular situations concerning what we should do or about what we have already done. A good conscience requires lifelong formation. Each baptized follower of Christ is obliged to form his or her conscience according to objective moral standards. Finally, the gifts of the Holy Spirit, combined with regular examination of our conscience, will help us develop a morally sensitive conscience. How do we determine what's right and what's wrong? This question might be the most disputed in our culture today. In other words, what is the basic standard by which we evaluate the ethics of human behavior? A widespread school of thought in our day would propose that right and wrong depend on outcomes. In other words, the aim of ethics is to bring about the happiness and well-being of as many people as possible, and whatever produces that happiness is ethical. Not only is this a popular philosophy at the academy, I would propose that it is hugely influential in the everyday thinking of many Americans. The Christian moral life is one that seeks to cultivate and practice virtue. Human virtues form the soul with the habits or mind and will that support moral behavior, control passions, and avoid sin. Virtues guide our conduct according to the dictates of faith and reason, leading us toward freedom based on self-control and toward joy in living the life in Christ. Scripturally and theologically, the Christian moral life begins with a loving relationship with God, a covenant love made possible by the sacrifice of Christ. The Commandments and other moral rules are given to us as ways of protecting the values that foster love of God and others. The moral life requires the grace. The grace that comes to us from Christ in the Holy Spirit is as essential as love and rules and, in fact, makes love and keeping the commandments possible. In the Gospel of Saint Matthew 7:21-23--Many think they please the Lord because they do "many wonderful works" in His name. Their goals may be good. But He will say, "Depart from me, you who practice lawlessness," because they are not doing the will of the Father. Even when the end is good, we must still respect everything else God specified. In Romans 1:1-3--The Jews had a zeal for God but not according to knowledge. The Hebrew people served the True God and did so zealously. Surely that is a good goal. But they set aside God's way of being righteous and pursued their own way of being right. Saint Paul said they needed to be saved. The end did not justify the means. Many people will justify gambling if its "for a good cause". Bingo and raffles are acceptable for a charity or even a church. States operate or license lotteries, horse race betting, and even casinos saying the money will be used for education. For years there were many parishes in our Archdiocese that held bingo, Las Vegas casino nights, and to draw crowds to these fund-raising activities the parish committee would hire an oriental dancer to entertain those present to raise the necessary funds to support the local parish. Whether for "a good cause" or not, gambling and the rest violated the teachings of God. The end does justify the means no matter how "noble" the purpose. Jesus' teaching often includes, not just general goals, but specific information about what to do to achieve those goals. We must observe "all" that He commands, including the means as well as the end. In the Church, there is no place for the belief which states "the end justifies the means." Everything done in the name of the Church must be consistent with Biblical teachings. Since the Holy Bible has stories and parables which touch every aspect of human life, the daily lives of individual Christians and of the Church as a whole must be guided by these teachings. In Ephesians 5:25-27--"Husbands, love your wives, just as Christ also loved the church and gave Himself for her, that He might sanctify and cleanse her with the washing of water by the word, that He might present her to Himself a glorious Church, not having spot or wrinkle or any such thing, but that she should be holy and without blemish." Let no one violate the purity, holiness and sanctity of our Church and Faith for money or for any other reason. No one has the authority or the right to prostitute the Church.